SUPERIOR CHASSIS: Tough and durable steel frame. Frame is contoured using a mandrel bend & welds are enforced for superior strength. METAL ON METAL: StaFast “T-nuts” are used to attach the seat and back to the frame, providing superior holding power. PLYWOOD SEAT & BACK: Superior plywood is used on all chairs. The seat features a 5/8" thick and the back is 1/2" for extra support. EASY CLEANING: Poly open arms caps allow for easy grip and a large wipe-out design allows for easy maintenance & clean up. 3" DUAL-DENSITY FOAM: We combine 2 different density foams to create a comfortable seat. LUMBAR SUPPORT: Each back has 1½” of foam and lumbar support, for long term comfort. 3" WATERFALL CUSHION: We take comfort very seriously. Our 3" waterfall cushion provides comfort to guest for long periods of time. REHAB / THERAPY SEAT: The elevated seat pitch is great for people who have mobility difficulties and / or special positioning needs (optional). FABRIC SELECTION: ComforTek stocks some of today’s top designer colours, patterns, and finishes. Visit ctsfabrics.com/titian to view all fabrics. 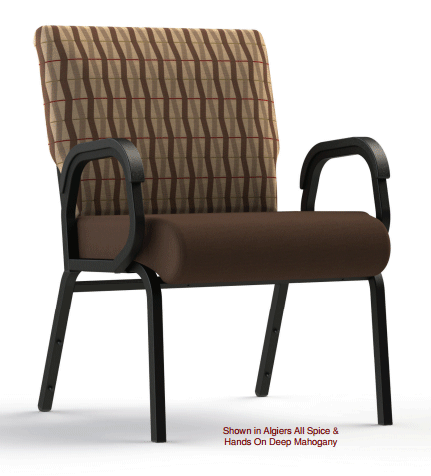 MADE IN USA: All Titan and Titan Plus+ Series of chairs are proudly made in USA.